Truck Thursday. Fast Fords Edition. Here are three of the HW ‘29 Ford Pickup. Two of which have been a bit reworked by Improbable Garage. As usual I built these on my twitch stream. 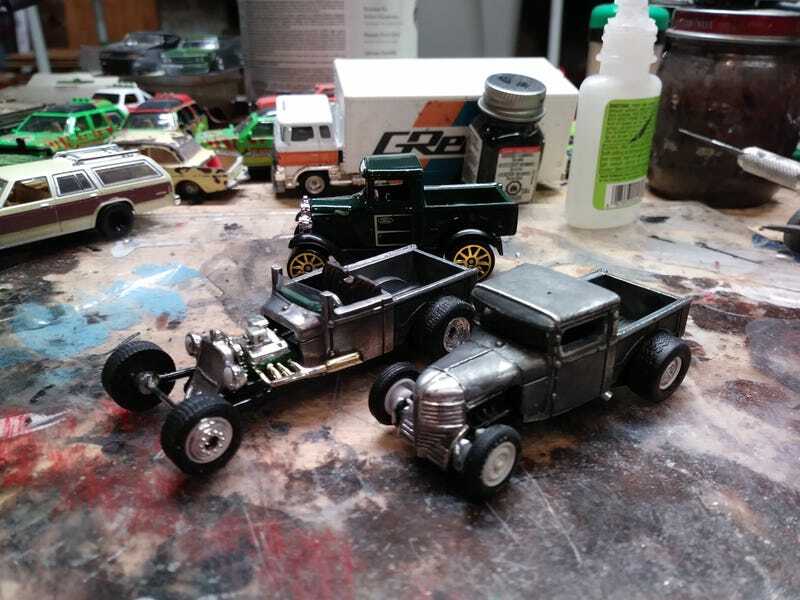 I started with the stripped bodies and just kept fiddling with them with no real plan, aside from wanting one chopped and the other a roadster. The roadster ended up an insane ratrod. After having the roof lopped off, the body was channeled over the chassis, and the hood & sides were removed. A V8 was found and fitted, with the exhausts modified to clear the width of the body. The gril is off a donor dodge truck i was sent a while back, and the front axle and its semi truck wheels are supported by brass rods. The other truck ended up a more realistic traditional hot rod. The roof was chopped, and the body once again channeled over.the frame. An amazing grille was found from a ‘39 Ward fire truck. Then the hood sides were removed and a V8 was fitted. Fat & narrow steel wheels were found off a JL pickup and a M2 mustang, with the rears painted Wimbledon White to match the fronts. Lastly some exhaust pipes were fitted, dumping out just before the rear wheels. The bodies of both were roughly polished with a wire wheel, then given a black wash to age them and pick out the details. While both are great, i confess i love the closed cab. Something about the way the grill flows, and the period correct wheels.